This volume presents a scholarly analysis of psychopathic and sociopathic personalities and the conditions that give rise to them. In so doing, it offers a coherent theoretical and developmental analysis of socialization and its vicissitudes, and of the role played in socialization by the crime-relevant genetic traits of the child and the skills and limitations of the primary socializing agents, the parents. This volume also describes how American psychiatry's (DSM-IV) category of "Antisocial Personality Disorder" is heterogeneous and fails to document some of the more interesting and notorious psychopaths of our era. The author also shows why the antinomic formula "Nature vs. Nurture" should be revised to "Nature via Nurture" and reviews the evidence for the heritability of crime-relevant traits. One of these traits -- fearlessness -- seems to be one basis for the primary psychopathy and the author argues that the primary psychopath and the hero may be twigs on the same genetic branch. But crime -- the failure of socialization -- is rare among traditional peoples still living in the extended-family environment in which our common ancestors lived and to which our species is evolutionarily adapted. The author demonstrates that the sharp rise in crime and violence in the United States since the 1960s can be attributed to the coeval increase in divorce and illegitimacy which has left millions of fatherless children to be reared by over-burdened, often immature or sociopathic single mothers. The genus sociopathic personality includes those persons whose failure of socialization can be attributed largely to incompetent or indifferent rearing. Two generalizations supported by modern behavior genetic research are that most psychological traits have strong genetic roots and show little lasting influence of the rearing environment. 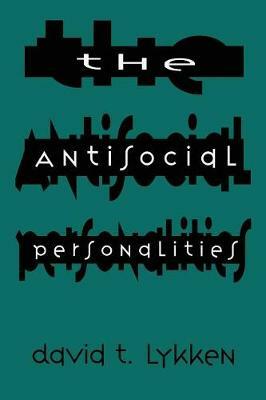 This book demonstrates that the important trait of socialization is an exception. Although traits that obstruct or facilitate socialization tend to obey these rules, socialization itself is only weakly heritable; this is because modern American society displays such enormous variance in the relevant environmental factors, mainly in parental competence. Moreover, parental incompetence that produces sociopathy in one child is likely to have the same result with any siblings. This book argues that sociopathy contributes far more to crime and violence than psychopathy because sociopaths are much more numerous and because sociopathy is a familial trait for both genetic and environmental reasons. With a provocative thesis and an engaging style, this book will be of principal interest to clinical, personality, forensic, and developmental psychologists and their students, as well as to psychiatrists and criminologists.